A cafe supervisor told an unsuccessful job candidate who blamed bad weather when she didn't turn up for trial shift that she had a 'poor work ethic' because she is British. Victoria Atkins, 22, had applied for a position at Intenso Espresso in Hove, East Sussex, and after successfully passing the interview was offered a trial shift last Sunday. But upon messaging the company to ask if she could rearrange the shift after being unable to get in due to weather, Ms Atkins received a series of 'rude' messages from Jullian Preston-Powers, who is also British. 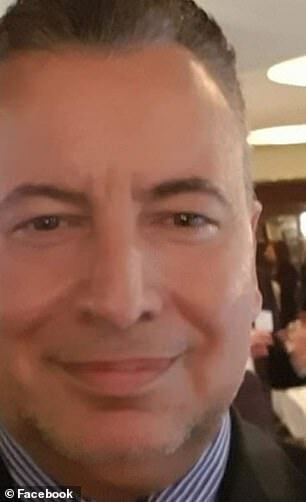 Mr Preston-Powers, who claims to have a 'supervisory role' at the cafe and is married to the owner, lamented her no-show, claiming a 'poor work ethic... is highly synonymous with being British'. The businessman went on to state that staff 'cannot ever call in sick' and that he would dock wages from a previous shift if they did so without a doctor's note. 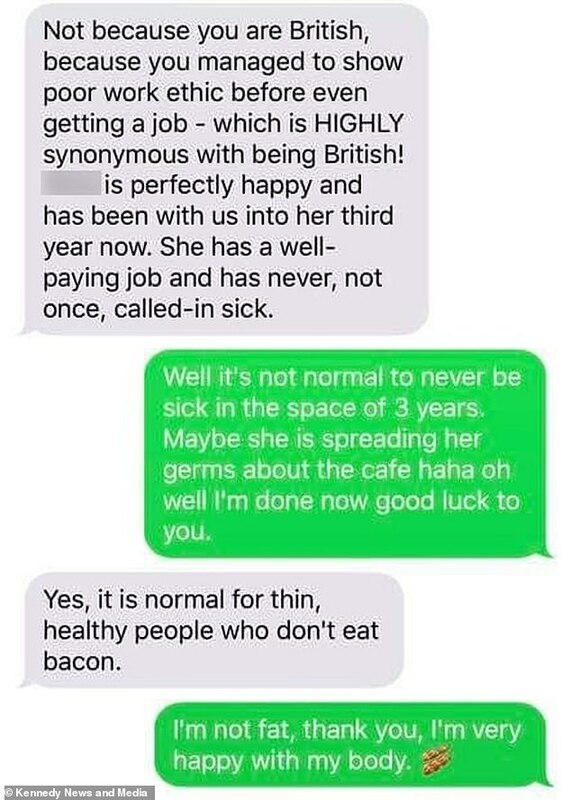 He went on to champion one staff member who hadn't had a day off in three years because that was normal for 'thin, healthy people who don't eat bacon'. Ms Atkins said she was 'very, very offended' and branded his statements about British workers 'nasty'. However, when approached for comment, Mr Preston-Powers defended and reiterated his stance that the 'very poorest type of employee is a British one, full stop'. The Trades Union Congress slammed his actions and defended British workers, who they claim 'put in some of the longest hours in Europe'. 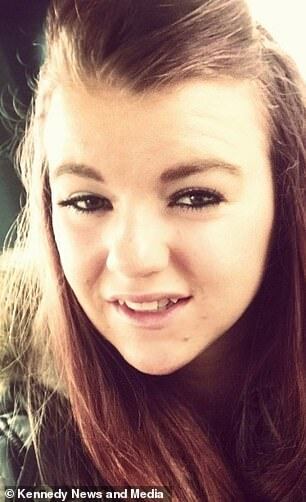 Ms Atkins, from Brighton, East Sussex, said: 'He is very rude and nasty. I'd had a really bad morning and just asked if I could rebook the trial shift. 'I'd taken the bus and left plenty of time, but due to delays I soon realised I would be late. 'By this time I was soaking wet because the bus only went half way, and my friend lives on the same road as the cafe so I went there to shower and dry off. 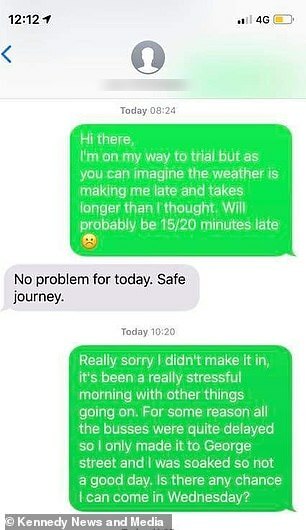 'I was already a couple of hours late so asked if I could go at a later date, which is when he said no. Ms Atkins said the member of staff who interviewed her had been polite and 'really lovely' and even offered her a trial shift, however she felt 'very, very offended' by the comments made by Mr Preston-Powers. His responses to her texts left her feeling that she was 'grateful' he showed 'who he really is' before she accepted a job. She said: 'I've worked in the food and drinks industry for years and used to be a barista at [popular coffee chain] and trained as a maestro. I also took management courses. 'I had plenty of experience and knew how to do the job well. When he made the comment about eating bacon, I was very, very offended. 'I never even met him and I'm happy as a size 10. He wasn't even at my job interview. In his message, Mr Preston-Powers wrote: 'Sorry you are having a stressful morning. It's probably better you did not succeed in getting the job because you can never be late for or miss work at our business. Ever. 'You cannot ever even call in sick as that is not allowed. 'Literally, you have to be at work as scheduled with us and if you do not, you get a whole day's wages from your previous shift docked and then are sacked if it happens just once again. When Ms Atkins replied saying 'how dare' he be rude to her because she is British and that he was an 'awful business owner', he carried on in further messages. 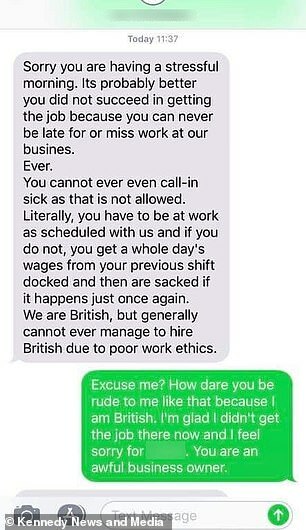 His second message read: 'Not because you are British, because you managed to show poor work ethic before even getting a job - which is HIGHLY synonymous with being British! Interviewed after the incident, Mr Preston-Powers stood by his belief that British people have poor work ethic and claims 'every single' British person he has employed in the past has had issues. He said his business' experience was that 'the work ethic of Brits are inferior to those of from Eastern Europe'. A TUC spokesperson said: 'If he's looking for the title of Britain's Worst Boss, it sounds like he's going about it the right way. 'It's illegal to discriminate against job applicants based on their ethnicity. And profiteering from staff illness by docking their wages is very likely illegal too. In 2008, the outspoken businessman told a 16-year-old member of staff to quit smoking or she'd be fired - and successfully helped her kick the habit. 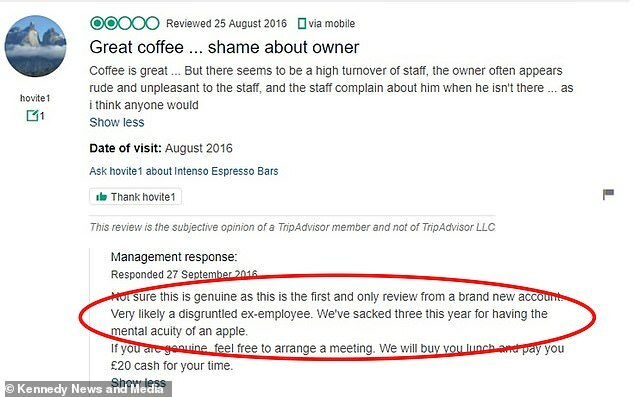 Cafe management have also referred to three ex-staff members as having 'the mental acuity of an apple' on TripAdvisor.